Earthy chili combines with the sour-power of sherry vinegar to create a fine dressing for grassy-green asparagus. For a smoky twist, try subsituting smoked paprika for the chile powder. Heat oil in a nonstick skillet over medium-high heat. Add asparagus and water; cook, stirring often, about 4-5 minutes. 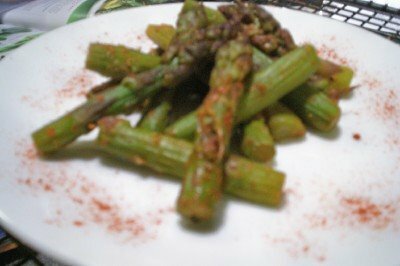 Add chili powder (or paprika), garlic powder, and salt; cook until asparagus is tender-crisp, about 1 minute. Remove from heat, add vinegar and stir to coat. 1. Heat oil in a skillet over medium heat. Add the red onion slices and the thyme. Saute, stirring frequently for 3-5 minutes, just until softened. 2. Meanwhile, combine the red wine vinegar, sugar, salt, and pepper in a bowl. 3. Add the sauteed onions to the vinegar mixture, stir well to combine. 4. Refrigerate at least 1 hour or overnight. This will keep in the fridge for several days, several weeks if vacuum sealed with a Foodsaver. **You can substitute your choice of dried herbs for the thyme. 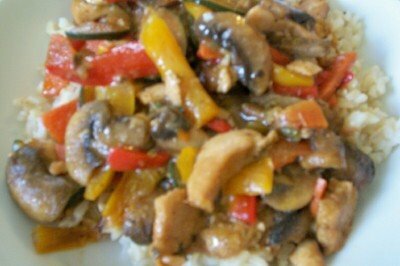 originally by Sandra on www.allrecipes.com but with my modifications. 2. Pour melted butter into the bottom of an 8-inch square pan. Tilit the pan so that it is evenly coated. Sprinkle the brown sugar over the butter. 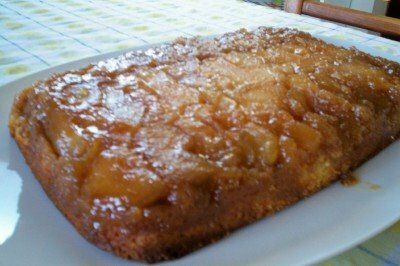 Arrange the apple slices to cover the brown sugar, set aside. In a medium bowl, cream the stick of butter and the white sugar. Beat in the egg and vanilla until light and fluffy. Combine the flour, baking soda, and salt, stir into the creamed mixture alternately with the milk. Pour into the baking pan so that the fruit is completely covered. 3. Bake for 40-50 minutes, or until a toothpick inserted near the middle comes out clean. Immediately invert onto a serving platye. Serve warm with ice cream or freshly whipped cream. Combine 1/2 teaspoon cornstarch, 1/2 teaspoon sugar, salt, and flank steak in a medium bowl; toss to coat. Set aside. Combine 2 teaspoons cornstarch, 1/2 teaspoon sugar, broth, soy sauce, and black pepper, stirring with a whisk until sugar dissolves; set aside. Heat oil in a wok or large nonstick skillet over medium-high heat. Add the green onions, ginger, and garlic; stir-fry 10 seconds. Add beef mixture; stir-fry 3 minutes or until done. Remove the beef mixture from pan; cover and keep warm. Add peas and bell peppers to pan; stir-fry 4 minutes or until crisp-tender. Add beef and broth mixture to pan; cook 2 minutes or until thickened, stirring constantly. In large pot of salted boiling water, cook fettucini until it's al dente, about 10 minutes. Reserve about 1 cup of the cooking water. Meanwhile, heat 1 tablespoon each olive oil and butter in a saute pan. Add chopped onion, and saute for 2-3 minutes. Add half of the minced garlic to the onions, and continue sauteeing for about 5 more minutes. Cook until the onions are soft and translucent, being careful not to burn the garlic. Add the asparagus, shrimp, salt, pepper, and red pepper flakes as desired. Cook just until the shrimp turns pink. Put the cooked shrimp and asparagus mixture in a bowl and cover to keep warm. Gently warm the milk in a small saute pan, being careful not to boil. Keep warm. Add remaining butter and olive oil to the pan. Add the remaining garlic, and saute for about 2 minutes. Add the flour and stir vigorously with a whisk for 1 minute. Very slowly, start pouring in the warmed milk all the while stirring with the whisk. Continue stirrung, and heat slowly just to boiling. Reduce heat to simmer. Add the parmesan cheese, and additional salt and pepper as desired. Stir to incorporate. Add the shrimp mixture and the fettuccini to the sauce. Toss well, adding up to 1 cup of the cooking liquid as needed to smooth out the sauce. Heat oil in a large skillet over medium heat until hot. Add onion and garlic. Cook until tender and lightly browned. Add spinach, tomato, basil, salt, and peppers. Cook 5 minutes, stirring occassionally. Stir in milk and cheeses. Cook until it just comes to a boil. 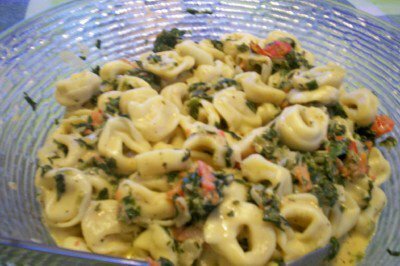 reduce heat and add tortellini. Cook until heated through. Position a rack in the lower third of the ovem. Preheat the oven to 400º. Make sure the paste dough is smooth before adding the next egg. Beat the dough until it is smooth and shiny. Choux paste can be covered and refrigerated for up to 4 hours. When it is cold, you do not need to bring it to room temperature before shaping. Scoop the paste into a large pastry bag fitted with a 1 inch tip for large eclairs/puffs or 1/2 inch tip for smaller ones. For best results bake small puffs on ungreased baking sheets, larger puffs on greased and floured baking sheets. Pipe the desired shapes onto your baking sheets, using a finger dipped in cold water to smooth the tops. If desired, brush with an egg wash, taking care to keep the egg from touching the baking sheet. Bake in a 400º oven for 15 minutes. Reduce the heat to 350º and bake for another 15 minutes for small puffs, and 25 to 30 minutes for larger puffs. Bake until golden brown and very firm to the touch. To allow more room for filling, you will want to dry the puffs further. For smaller puffs pop them off the sheets and poke a small hole in the bottom of the puffs, using a skewer or paring knife. Place upside down on the baking sheets and return to the oven(while it is off) for another 10 minutes. After the 10 minutes, remove to a cooling rack to finish the cooling. To fill, use the hole that you already poked in, or split in half. 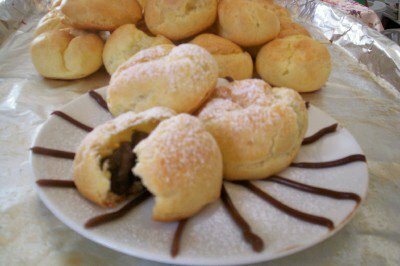 Once baked and filled, choux pastries should be served immediatley, or refrigerated and served within several hours. However, unfilled baked shells can be frozen for up to 1 week in an airtight container.